Beautifully animated and frequently laugh-out-loud funny, this is a hugely enjoyable Disney comedy/musical with strong characters, superb voice performances, terrific songs and a witty, intelligent script that sneaks in a tiny subversive edge. 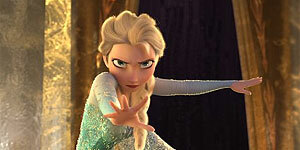 Co-directed by Chris Buck and Jennifer Lee, Frozen is loosely based on Hans Christian Anderson's The Snow Queen and centres on two sisters: older sibling Elsa (Idina Menzel), who discovers that she has magical powers and can create snow and ice with a wave of her hands, and her younger sister Anna (Kristen Bell). However, after a childhood accident almost kills Anna, she has her memory wiped and Elsa is ordered to keep her powers secret and never to play with Anna again, so the pair grow up apart. On the day of Elsa's coronation, Anna announces she has fallen in love with a man she has just met (Santino Fontana as Hans), causing Elsa to lose control of her powers and accidentally curse the entire kingdom with eternal winter, whereupon she flees to an ice palace she creates in the mountains. Though ill-equipped for the icy terrain, Anna sets off to find her sister, gaining help from a friendly ice salesman (Jonathan Groff as Kristoff), his reindeer Sven and a talking, summer-obsessed snowman called Olaf (Josh Gad) they meet along the way. Kristen Bell is wonderful as Anna, delivering an enjoyably feisty performance and displaying impressive comic timing; she also does a terrific job with the musical numbers, more than holding her own against Broadway star Idina Menzel, who, in turn, brings the house down with the film's central number Let It Go. There's also strong comic support from both Groff and Gad (Olaf's dreaming-of-summer song is a definite highlight), while Sven the reindeer takes a leaf out of the horse from Tangled's book and steals plenty of laughs without actually speaking (although there's a nice running gag where Kristoff speaks in a reindeer voice for him). The film is beautifully animated and the level of detail on the snow and ice is extremely impressive. In addition, the witty, intelligent script is frequently laugh-out-loud funny (the interplay between Anna and Kristoff is utterly charming) and it even manages to weave in what passes for a subtly subversive note in the final act, both in terms of the message the film gives out and the way the film compares to previous Disney princess movies. The musical numbers are delightful (there's almost certainly a Broadway show in the film's future), striking a good balance between traditional A Whole New World-style numbers and Book Of Mormon-style comedy songs (not entirely a coincidence, given the presence of Mormon songwriter Robert Lopez). On top of that, there's a strong mix of both verbal and visual gags, including a number of inspired background gags that will reward multiple viewings. Frozen is a hugely entertaining Disney comedy musical that's a treat for all the family. Unmissable.